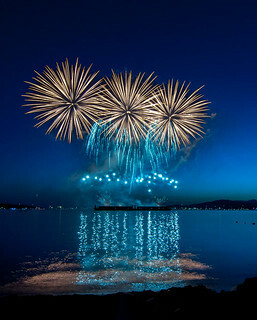 The Honda Celebration of Light will paint the skies over English Bay starting this weekend as hundreds of thousands take to balconies, roof tops, benches, and beaches to catch the spectacle on July 28th, August 1st, and August 4th. I posted my “Best Viewing Spots” in 2010 and they’re still applicable today. English Bay will be busiest but you can also get a view from a few other places along the Seawall and in Kitsilano. My rendering of the road closures and viewing spots. Of course the best seats in the house, or rather in the bay, will be the Bleacher Seating with tickets available for $39 to $59 with all proceeds going to support the Vancouver Fireworks Festival Society. On all fireworks days the West End will be closed to traffic except residents. Residential traffic access to the West End will be at Nelson and Thurlow, Davie and Thurlow, Burnaby and Thurlow, and at Nicola and Robson streets. For residents west of Denman, access is available on Alberni west of Denman. 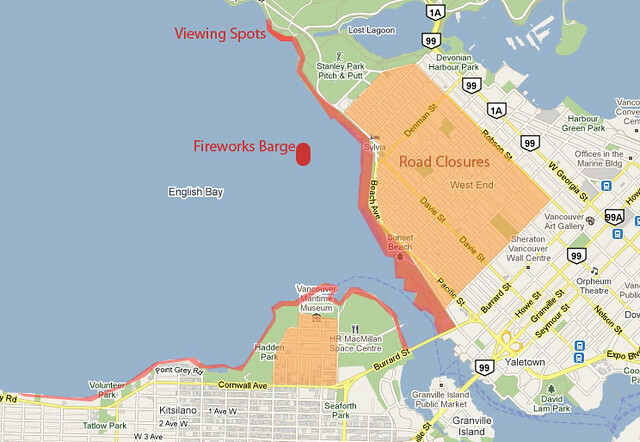 These restrictions will be in place from 7:30pm until 11:30pm in the West End and from 6:00pm to 11:30pm in Kits Point. Residential and commercial traffic at Kits Point should use Maple and Cypress Street northbound to cross Cornwall to access Kits Point on event nights. No access will be permitted from Cornwall. From Translink: Expo, Millennium and Canada Lines will provide “rush-hour” service on all three nights beginning in mid-afternoon, with every available train in service after the show to clear people out of the area as quickly as possible. The last Expo/Millennium Line train will leave Waterfront Station for King George at 1:16am. The last Canada Line train will leave Waterfront for Richmond-Brighouse at 1:15am. Trains will continue to run until everyone has been picked up from the downtown platforms (customers must be inside the stations when the gates are closed). In order to avoid lineups at ticket vending machines, buy your return tickets en route to the fireworks. Portable fareboxes will be at: King George, Granville, Burrard, Bridgeport, Yaletown-Roundhouse, Vancouver City Centre. Only accept exact cash fare. You only need to enter once (or complete one of the entry methods listed above) since the photos will be selected by a guest judge and me (guest judge to be announced). One winner will be selected by 5:00pm on July 29th and they will receive a $25 Cactus Club gift card. One winner will be selected by 5:00pm on August 2nd and they will receive a $25 Cactus Club gift card. An overall winner will be selected from all photos entered, from both days, and they will receive two VIP tickets to the Keg Lounge for the final night on August 4th as Italy lights up the skies. The Keg Lounge includes VIP parking, live music, 2 complimentary welcome drinks along with hors d’oeuvres and a grill station, and VIP seating (value $400, must be 19+). The Grand Prize winner will be selected by 5:00pm on August 2nd as well. Get your cameras ready and share your photos for each country’s display and you’ll be entered to win. Thanks to the Honda Celebration of Light and Cactus Club Cafe for offering up the prizing for this contest. This summer, be sure to check out the Cactus Club Cafe on English Bay along with their new take-out concession window along the Seawall. I enlisted local tech blogger and photographer John Biehler to help me pick a winner for the first fireworks night and we both had this photo on our list of favourites. Congratulations! The second winner is user sukhrajb on Instagram for this shot from the Burrard Bridge! 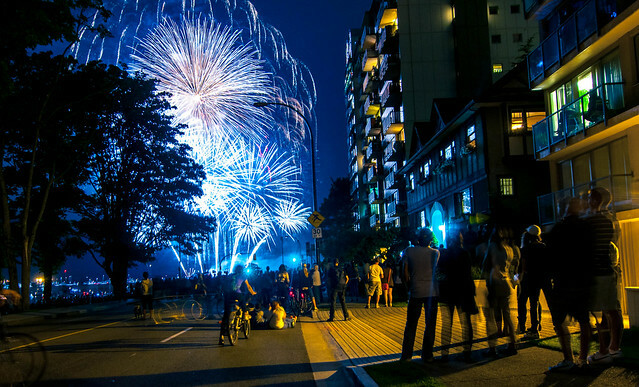 The grand prize winner is someone who’s angles and perspectives have never been captured before — at least John Biehler and I haven’t seen these point of view before for Vancouver fireworks photography. We had to award the grand prize to… colink.! The next winner will be selected after Wednesday’s fireworks then we’ll choose a grand prize winner from ALL entries. Fine print: Photographers retain all the rights and licenses for their images and the images submitted will not be reproduced. I do ask permission to post the winning photos on my site, in relation to this contest, with credit to the photographer. I went last year for the first time and it rocked! So many people and with a new baby (not safe and too loud). I could really use some of that Cactus Club butternut squash ravioli right now … oh man, so good. Hi, Not sure how to post in twitter, so I will post it here again. What was the Western themed music that played with the Team Vietnam show last night? First of all, what an awesome Idea for a photo contest. I can’t wait to take some shots tonight. Also thanks for the tips and information provided for getting around. Hi there, I found your site and the contest while looking for road closure information. Thanks for having such a thorough collection! Here’s my submission from Brazil’s terrific show last night.